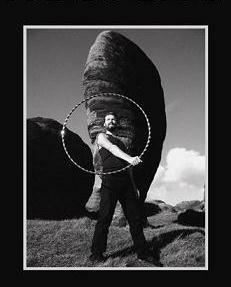 Once you are comfortable with hand rolls you can try to take your elbow through the hoop. 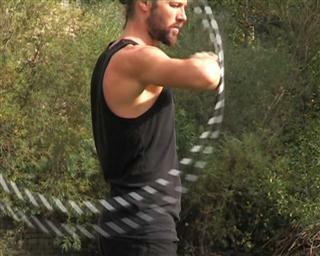 You can keep the hoop going around your elbow in both horizontal and vertical planes. The horizontal plane is fairly difficult so I'll come back to it later. 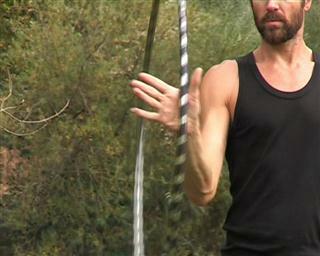 For now I'll try to show how to take your elbow through the hoop from hand rolls. There's an obvious space in the hoop to take your elbow through. Finding the timing can be difficult. The hoop stays in the same place, you move into the hoop. The time to start the movement is as the hoop rolls onto your palm. You can go back to the method of learning the hand roll for this if it helps. 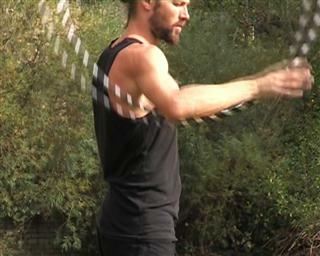 Push down with your hand to give a burst of power to the hoop. and keep your arm level or the hoop will fly off. Push your hand forward to provide power. Use a back forward motion to keep the hoop going. Ensure that your fore and upper arms are at the same level. Now that you can keep the hoop going on your elbow you need to take it back to your hand. This time the space is in front of you. 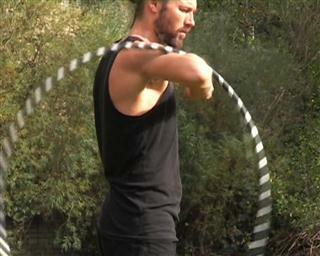 Start to move your hand into line as the hoop leaves your wrist. your hand should be in position, ready to catch the hoop. Once you have made contact with your hand, move your elbow back. 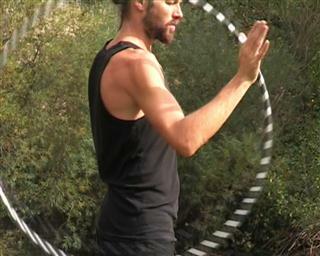 You may want to grip the hoop lightly to stabilise it. Then you can go back into hand rolls.